Normally Vicki and I go out backpacking together, now that our kids are grown, but this time she was away for a week visiting relatives. 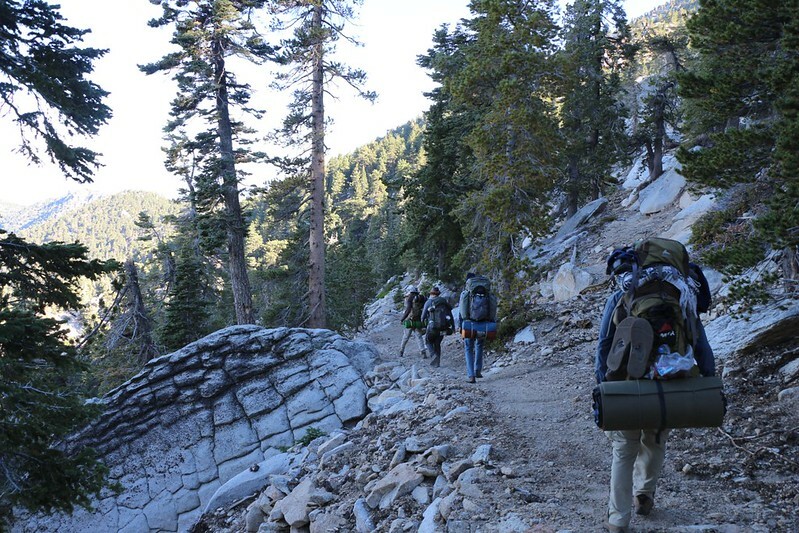 I decided that backpacking beat the heck out of staying home alone, so I enlisted my son and three of his friends, and the five of us set off for the Fuller Ridge Trail, Little Round Valley, and a three day weekend full of peak bagging. Bro’s Only. Sorry, ladies. The only problem I foresaw was that these four dudes were all 25 years younger than me, and that I might not be able to keep up the pace. That they wanted to climb every rock along the way was merely an added bonus! 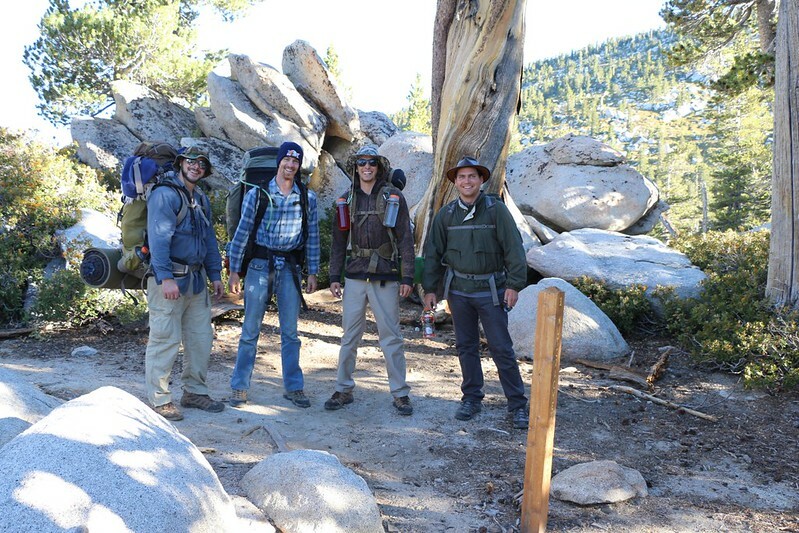 We arrived at the trailhead just after dawn, and proceeded to get ready for the hike. 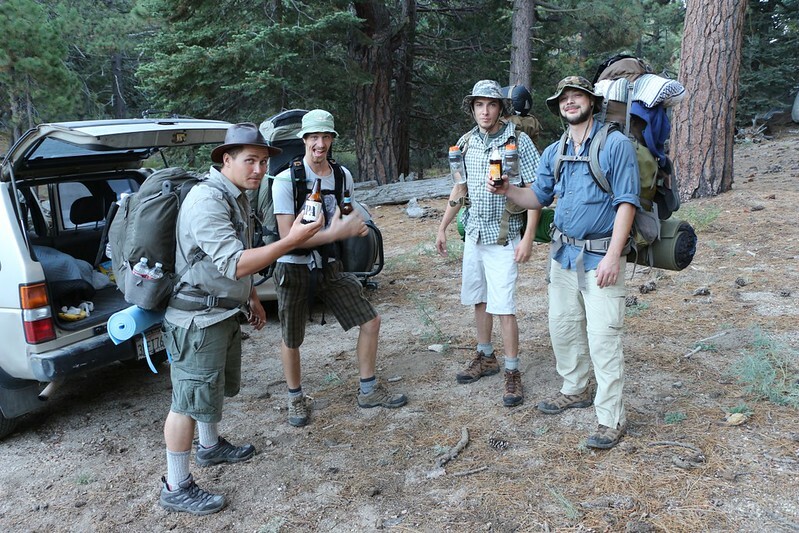 Now, normal people typically get ready by double-checking the contents of their packs, tightening the laces on their shoes, and applying sunscreen to themselves, but that wasn’t enough for these guys: They decided to have a Beer for Good Luck! Ah, yes. 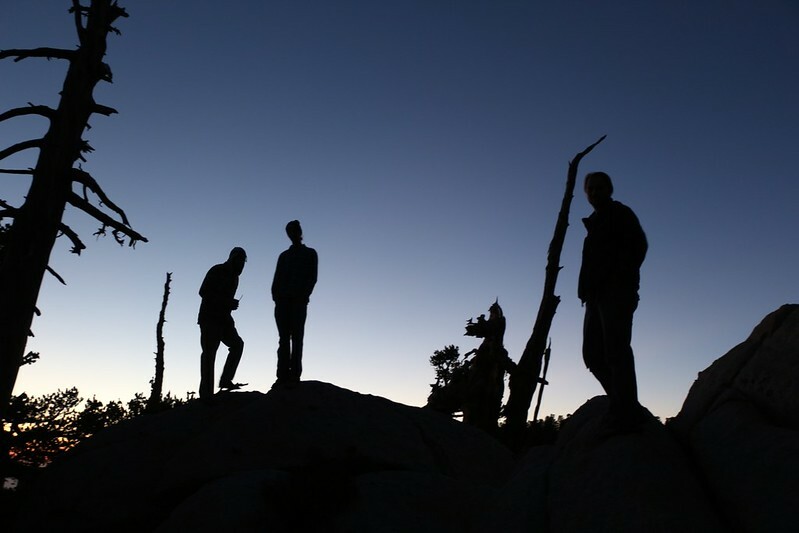 Beer at the crack of dawn, a sure-fire way to get yourself moving in the morning! But I didn’t partake; I was 25 years wiser! I took photos instead. 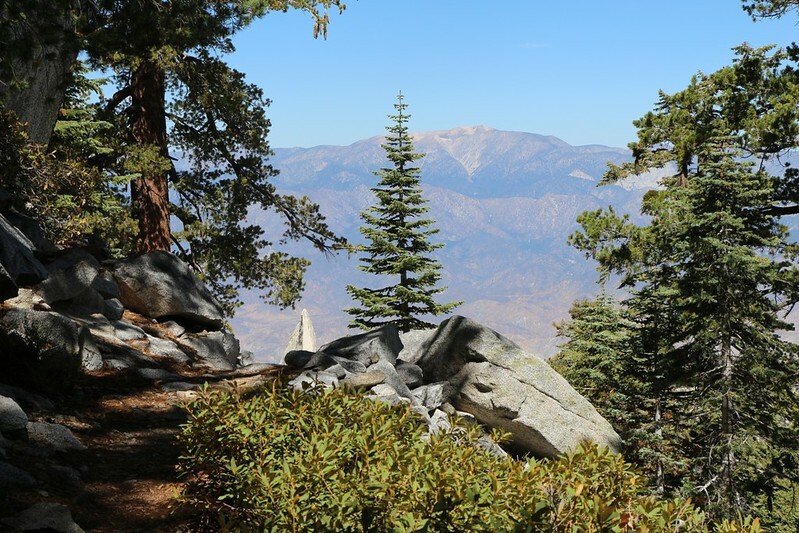 At first the trail heads east, providing great views toward San Gorgonio Mountain, which stands majestically across the way, beyond the deep drop down to Highway 10 and the San Andreas Fault. 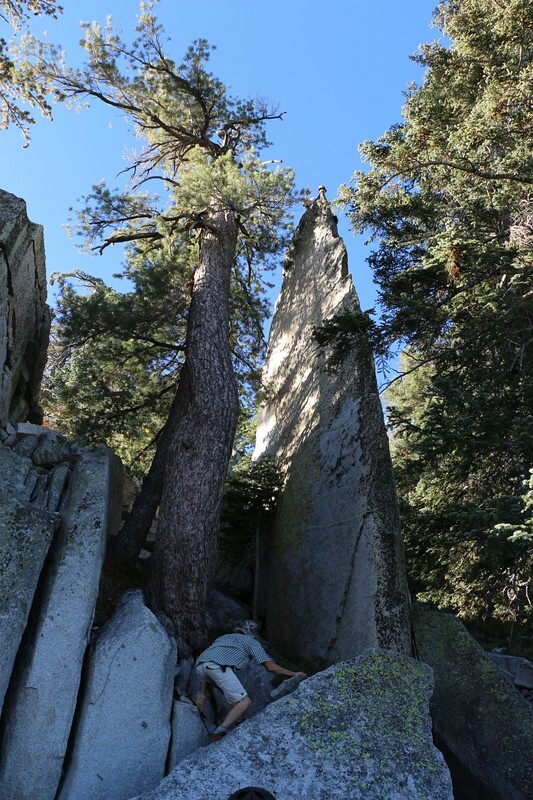 It wasn’t long before we came upon Knife Blade Rock, a towering blade of granite that soars above the trail. My son immediately found a way to climb up on top! And his friends weren’t far behind. 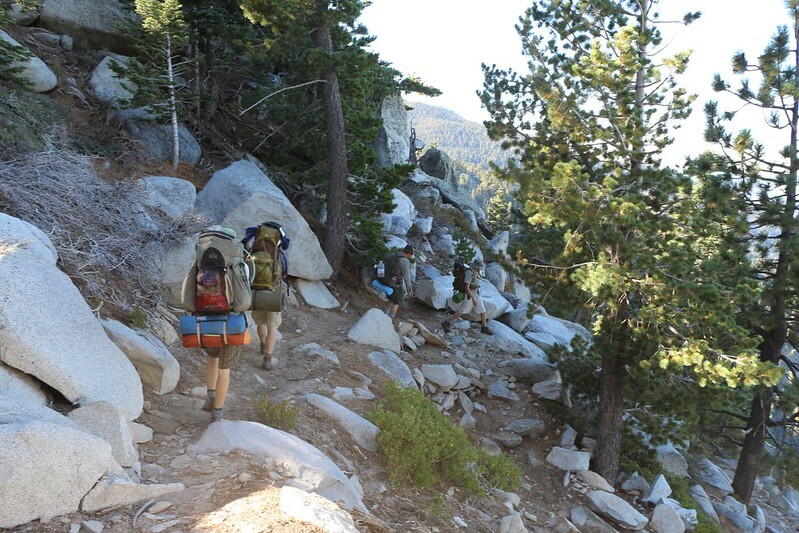 I sighed and put down my pack, as it looked like we were resting, even though we’d only hiked for fifteen minutes. Maybe it was the beer or maybe the cool rock, or both. Still, you couldn’t ask for a nicer place to stop. So I took more photos. We were in no rush, after all. Knife Blade Rock on the Fuller Ridge Trail. My son is up on top! 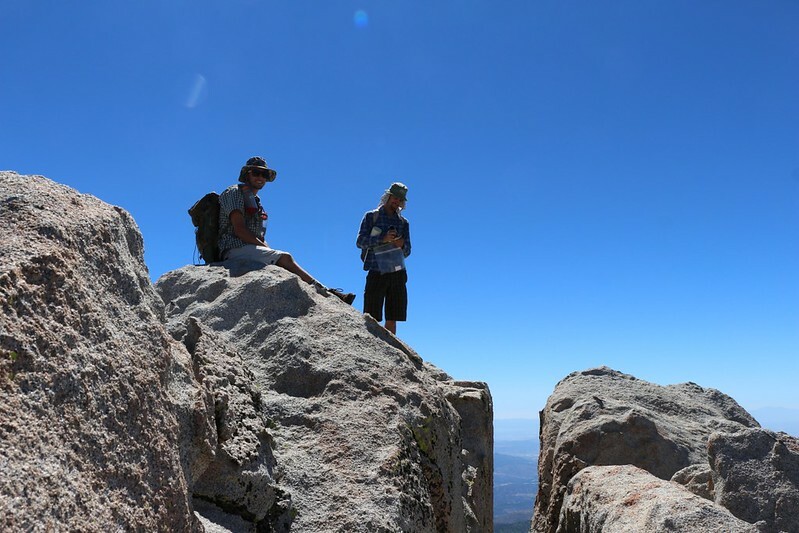 The guys on top of “Knife Blade Rock” – the view from the back side. 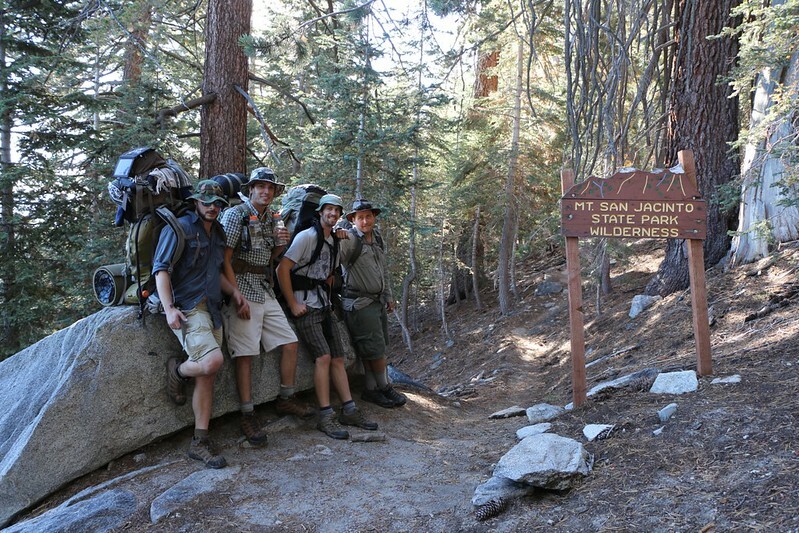 We stopped for another break at the Wilderness Boundary Sign, and adjusted some of the packs. Some folks had new gear, and some had too much. We got it squared away. 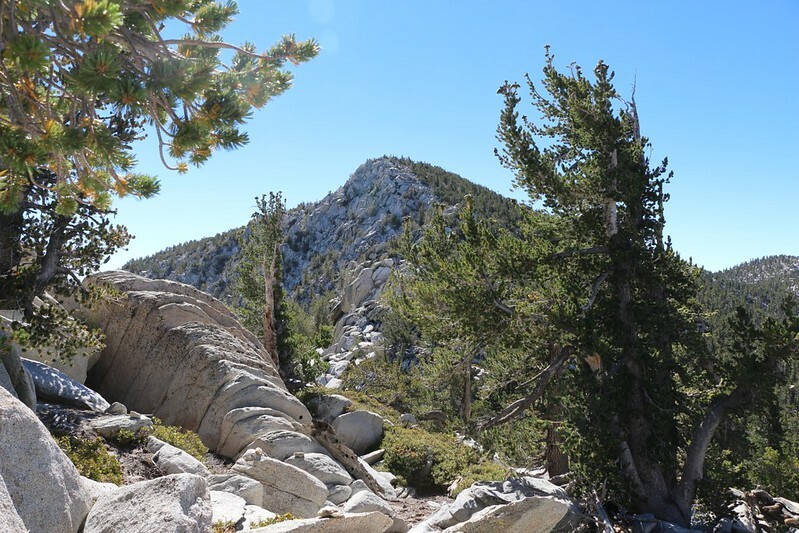 Then we stopped again after a long climb, where the trail crested the ridge at a saddle. We had views on both sides of the ridge. Beautiful! 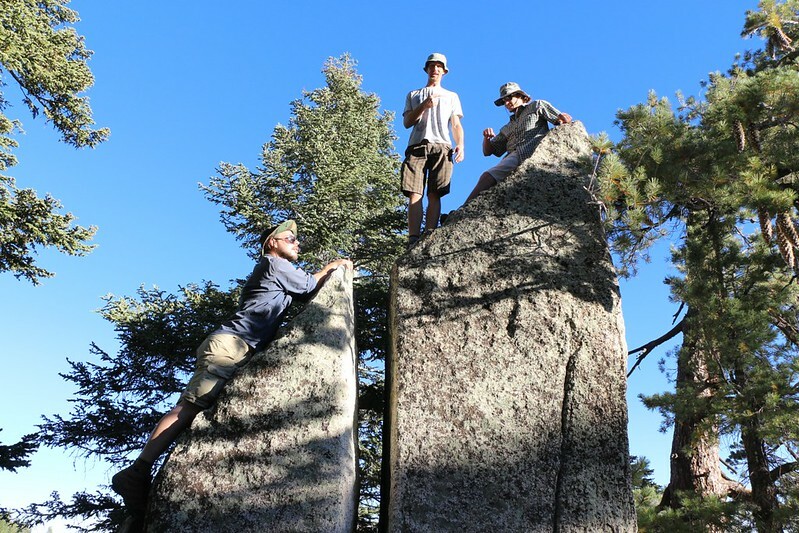 More photos were taken and more giant granite boulders were climbed. Why? Because they wanted to be climbed! The trail continued along the ridge as it curved southward, hiking first on one side, then on the other. 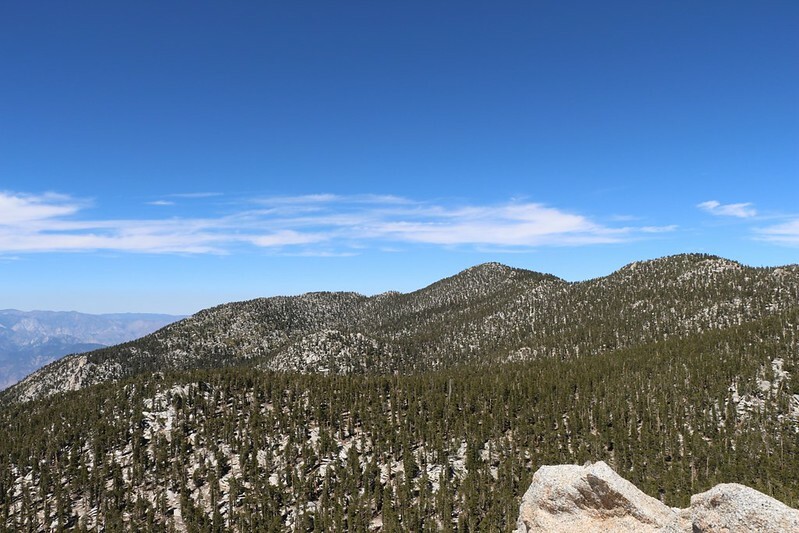 There were great views west toward Idyllwild and east toward Palm Springs, with the always-present massiveness of San Jacinto Peak up ahead of us. And, yes, we took more rests. Eventually, the trail stayed flat while the ridge soared away upward on our left. We were heading for the intersection with the Deer Springs Trail. We ate lunch at a great spot with fine views and shade, and took another rest at a near-dry watercourse. We took an extra-big rest at the trail intersection, as we knew that the bulk of the climbing lay ahead of us. By this time, it was hot out. And the trail switchbacked upwards through manzanita and buckthorn, low shrubs that allowed the sun to beat down upon us. It was a sweaty climb. Those of us carrying more weight suffered more, not surprisingly, and fell behind the others. We’d stop to rest in the shade of every tree we came upon, and turn to face what little breeze there was to be found, fanning our shirts to cool our torsos. 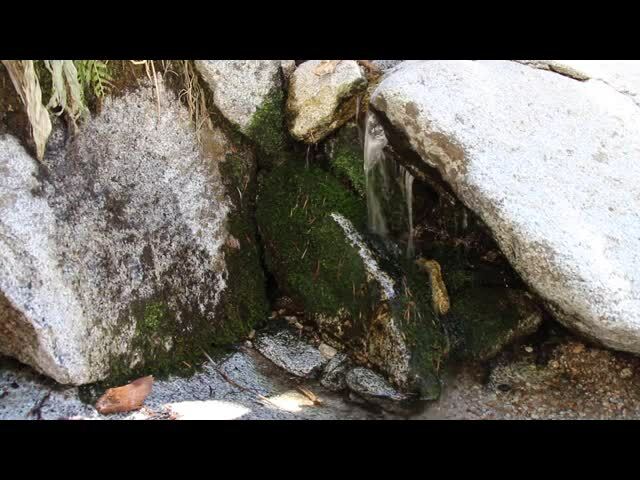 Soon enough we came to “Bed Springs” which was known to have the only flowing water near our camp. Still, it was a good half mile from camp, and downhill. We decided to filter a few gallons now so that we wouldn’t have to come back here until tomorrow afternoon. We sat around and enjoyed the sound of running water while taking turns pumping and filtering. We filled every vessel we had. Bed Springs water flow on the Deer Springs Trail. We filtered a few gallons and hiked on. Bed Springs Video. It was flowing nicely back on Labor Day 2014. 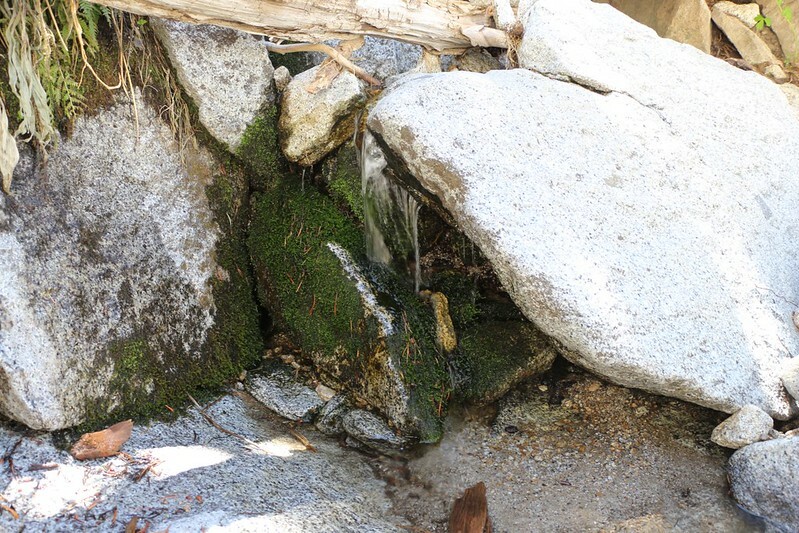 Then we trudged on, climbing the steepest part of the trail, bowed down under our newly-acquired water weight. 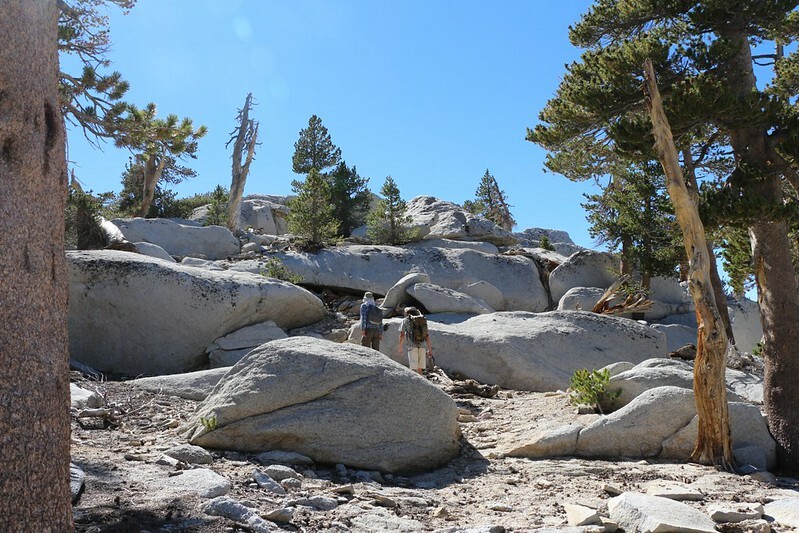 We were unbelievably relieved to reach Little Round Valley, so that we could set down our packs. The guys wanted to take a big rest, but I convinced one of them to come with me and search for a good campsite. We found one, up on a high spot with nice views and shade. I took a photo of the four of them when we got back, all of them sweaty, barechested, and exhausted. Did I look and feel like that? No. Definitely not. I was in much better shape. 25 years better, in fact! 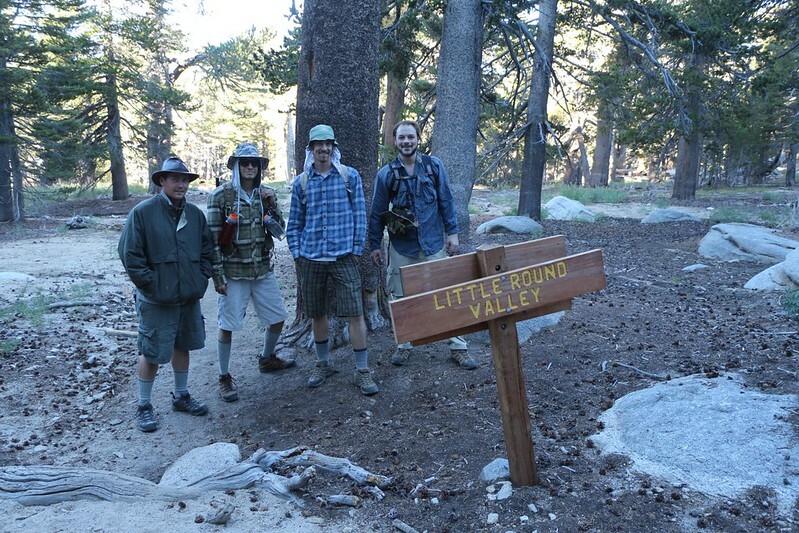 Tired hikers arrive in Little Round Valley. Yes, that last stretch was steep and hot! We set up camp and made dinner, then relaxed and enjoyed the sunset. I don’t know about the others, but I went to bed early. We’d left San Diego at three AM and I’d woken up at one. I was very tired. The next morning I got up early and started boiling lots of water for breakfast. That was what this crowd needed to get them out of bed in the absence of beer: Ready-To-Eat Food and Coffee. After that it was easy to get our day-packs put together for the peak-bagging plan. Stage one: Climb Folly Peak. We headed straight upslope from Little Round Valley. 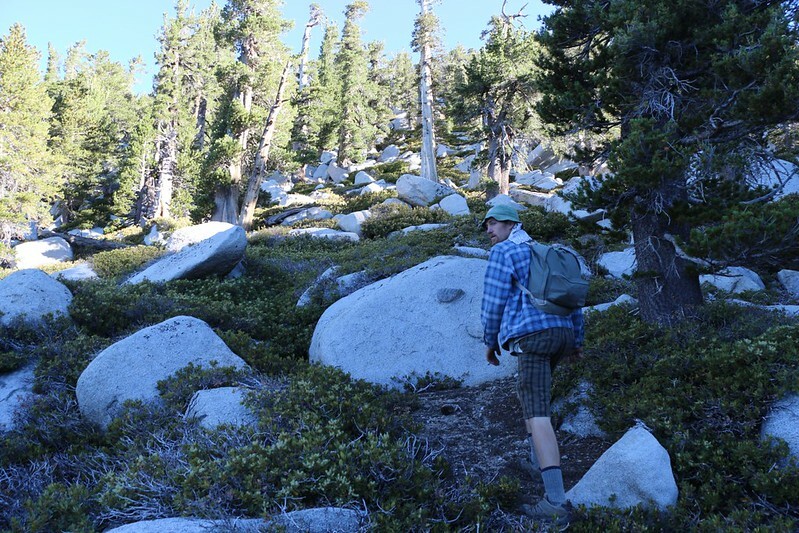 We used a combination of GPS bearing and the “Rule of Up.” The climb got quite steep at times, ascending over 700 feet in elevation to the summit at 10,480 feet. Luckily, the brush wasn’t too bad, and one could easily find a path around the chinquapin plants, or stomp through them when necessary. But it was definitely steep! 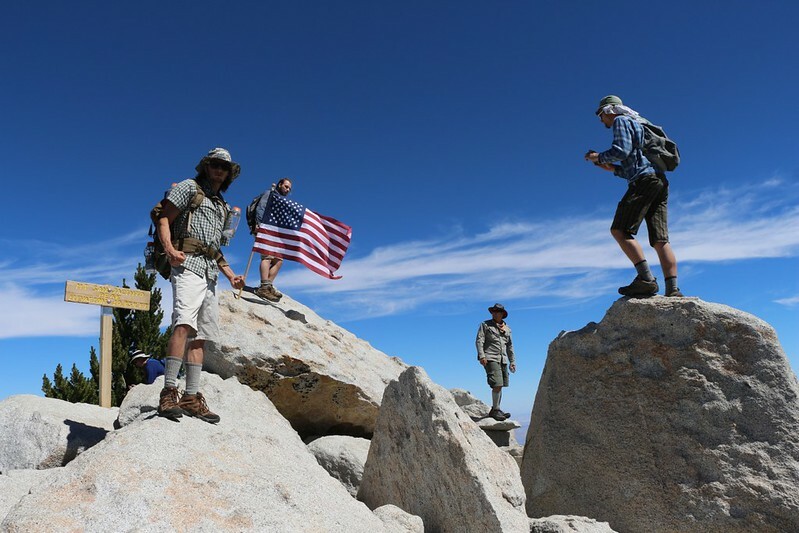 The Folly Peak Summit was great. 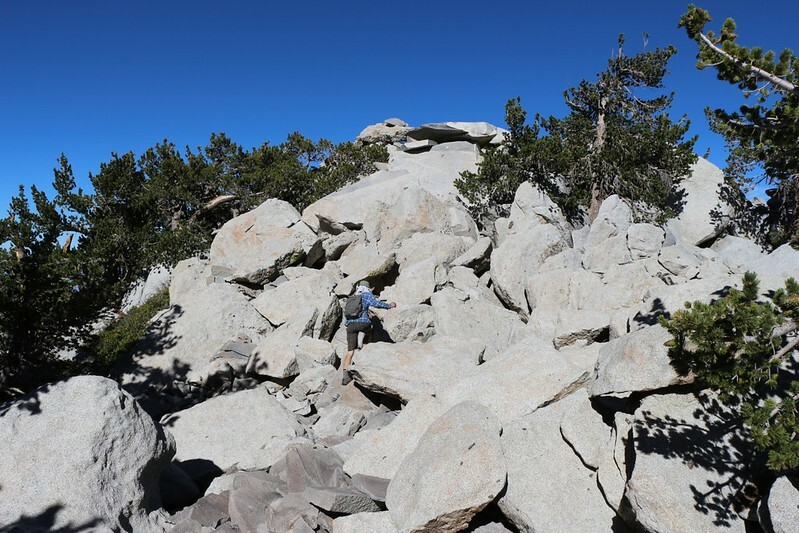 Lots of great scrambling on the big granite boulders. 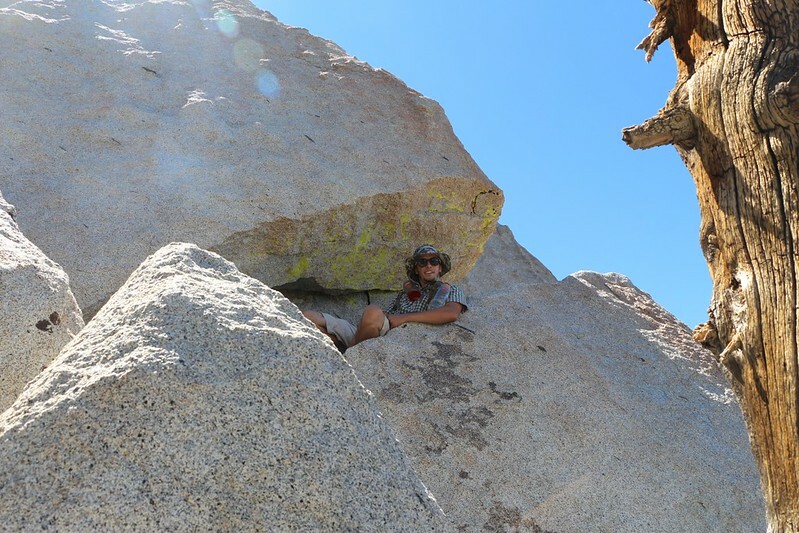 San Jacinto Granite sure is grippy on the shoes. 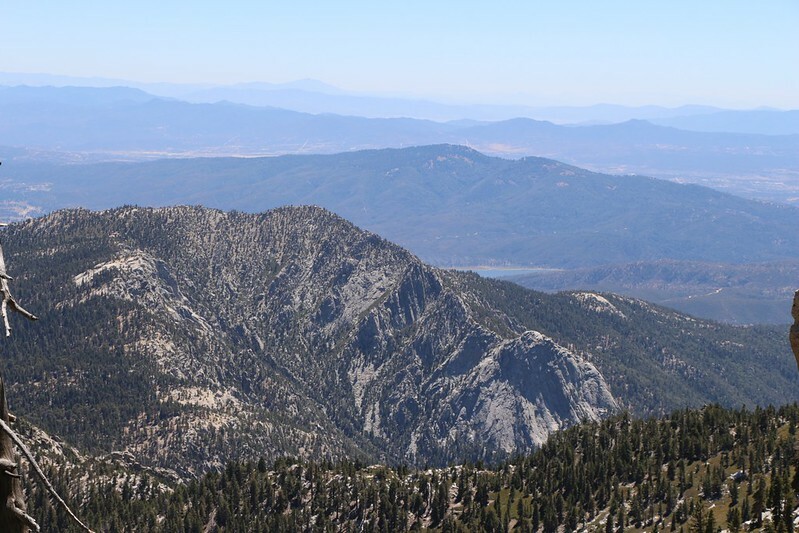 And the views were phenomenal, especially back toward Fuller Ridge, which we’d hiked along the day before. And we could see the long dirt road we’d driven to the trailhead, snaking its way up the sides of the valley onto the ridge proper. 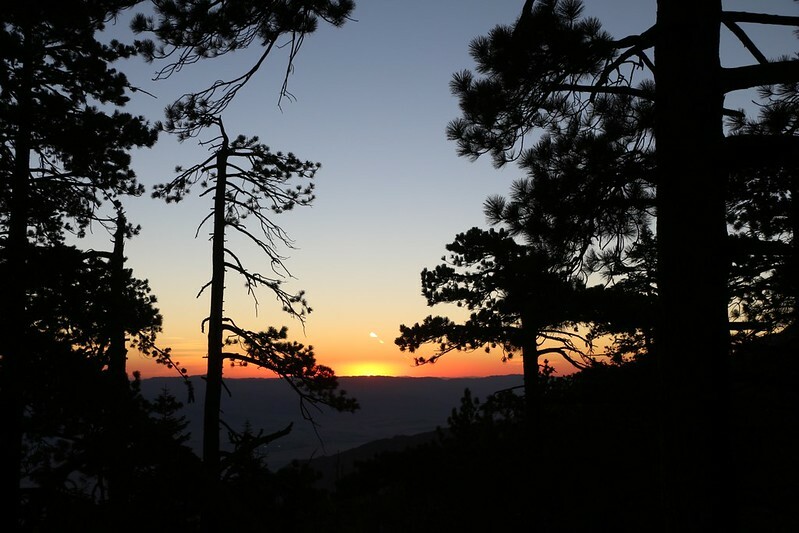 We could see northwest to Mount Baldy and San Gorgonio Mountain. And northeast into the desert, looking down on all the seemingly tiny windmills spinning around in the ever-windy Banning Pass, ten thousand feet below us. 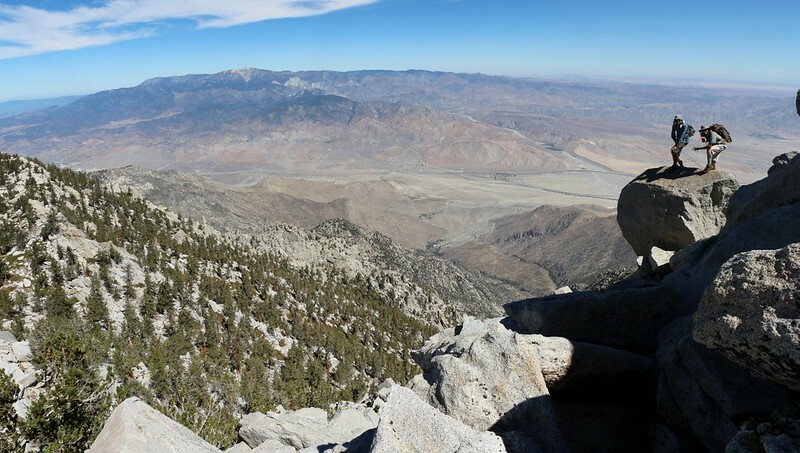 View west from the Folly Peak Summit. Also great views of Fuller Ridge. 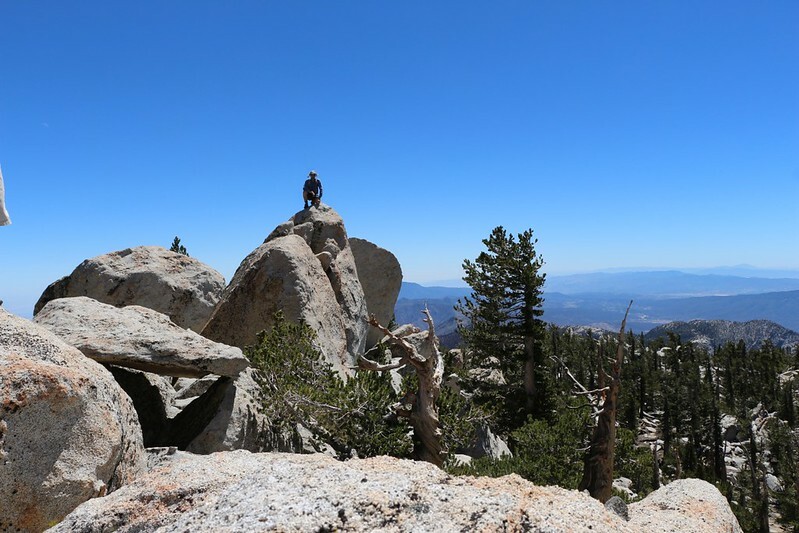 After that, it was time for the main attraction: San Jacinto Peak (10,834 feet elevation). It sure looked different from the Folly side! We scrambled along the ridgeline as we climbed. 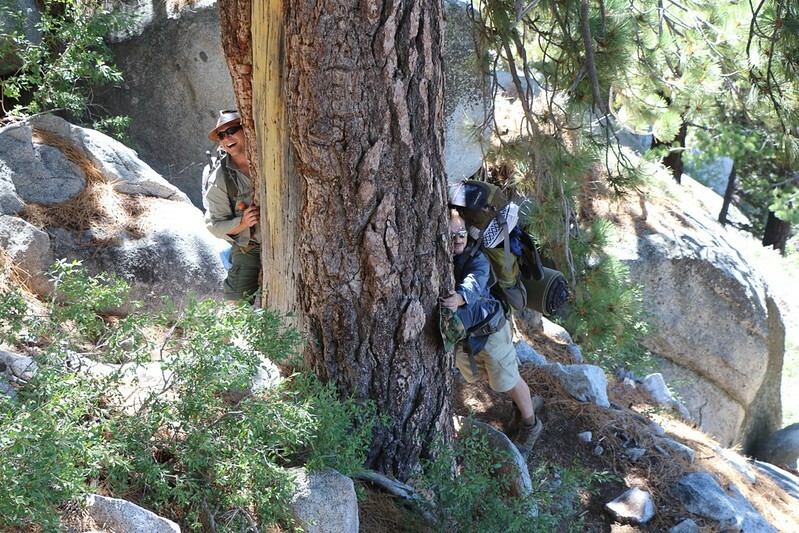 This is when I realized that I was hiking with maniacs. They stayed on the very edge of an insane dropoff the entire way. The safe way was no way. They purposely found excuses to make the route Class Four; anything less dangerous and you were a wimp. I was a wimp. 25 years wimpier. 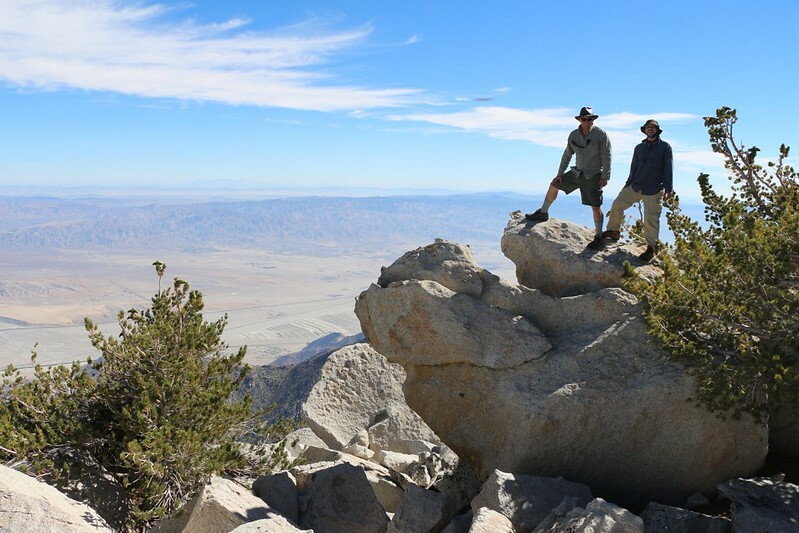 Maniacs on the edge of doom, while climbing San Jacinto Peak from Folly Peak. 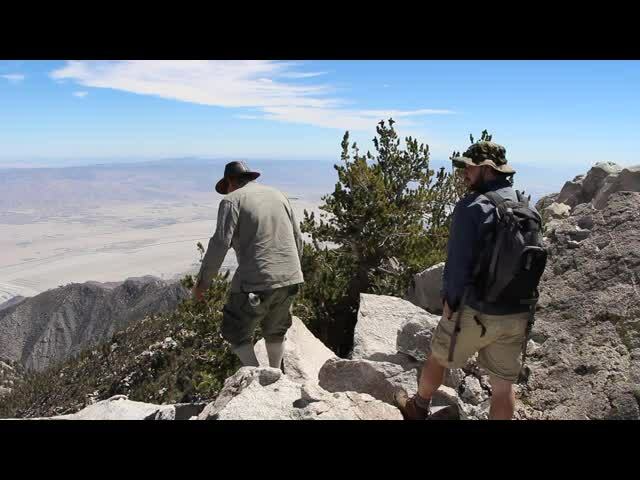 We summited San Jacinto Peak, which is always satisfying. 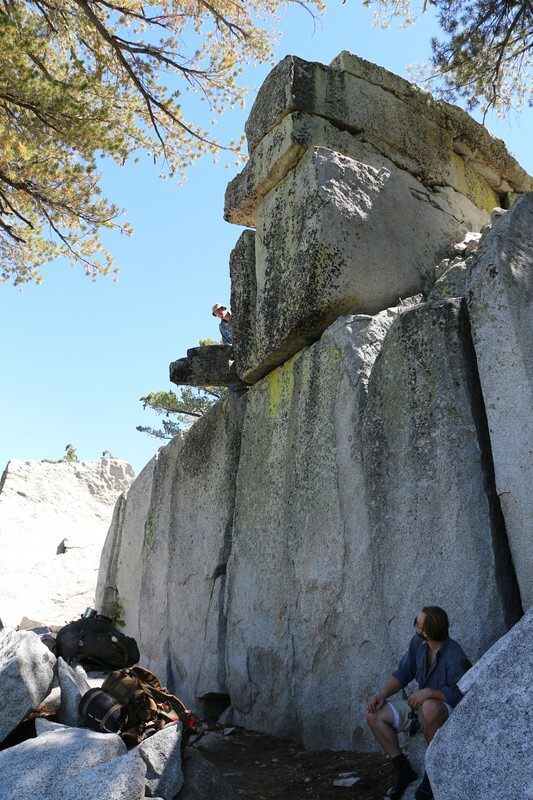 We jumped around on the big boulders and took some pictures, then ate some lunch. But we didn’t stay there long. We had more peaks to bag! So we headed off-trail once again, cross-country to Jean Peak this time. 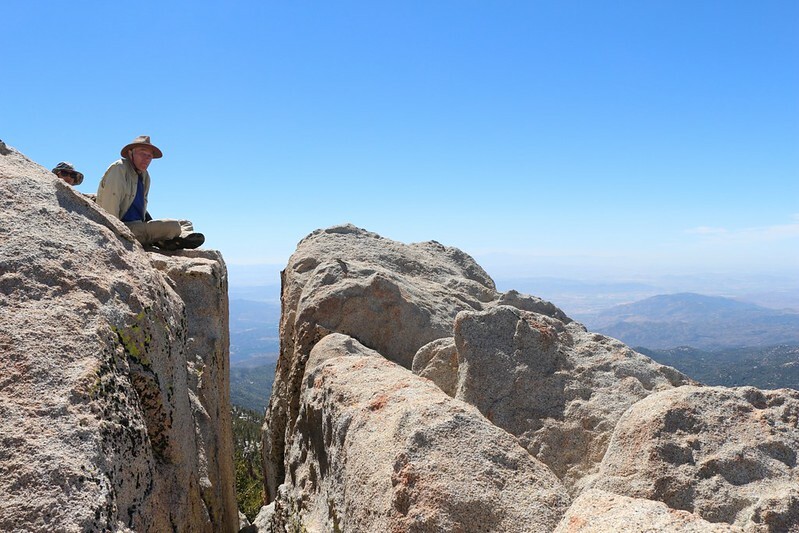 The Jean Peak summit (10,670 feet) was pretty fun but there were far too many trees, so the views were limited. We didn’t stay there long. A view of Marion Mountain from the Jean Peak summit. 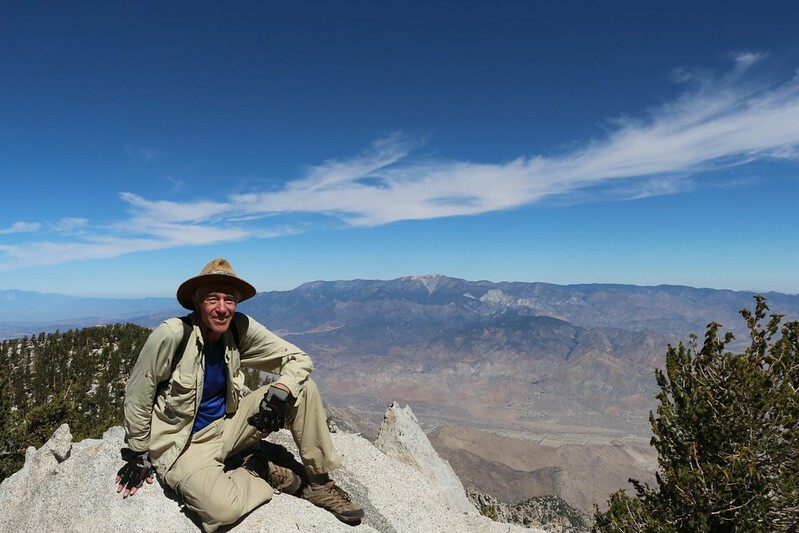 We headed downhill to Shirley Peak (Peak 10388) which had better views, especially south. 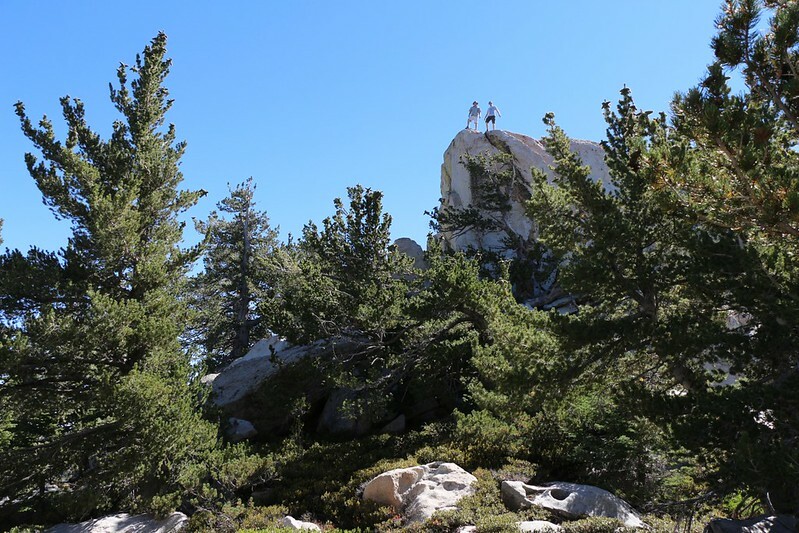 It was fun to climb up its granite summit block. Soon enough, we came to what can only be called the highlight of our peak-bagging expedition: Marion Mountain (elevation 10,362). What made it great? The summit block. 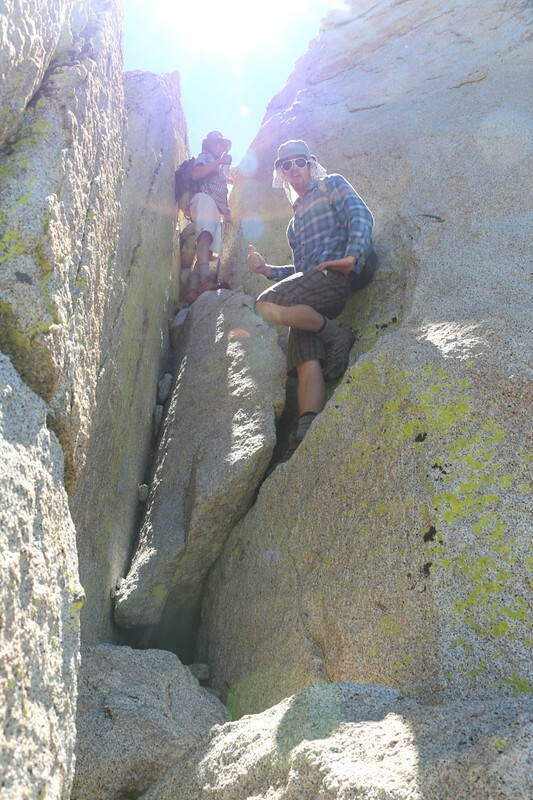 And the climb up a large crack to the top. Once there, we had even more great views. We sat around, eating our snacks and enjoying the afternoon. 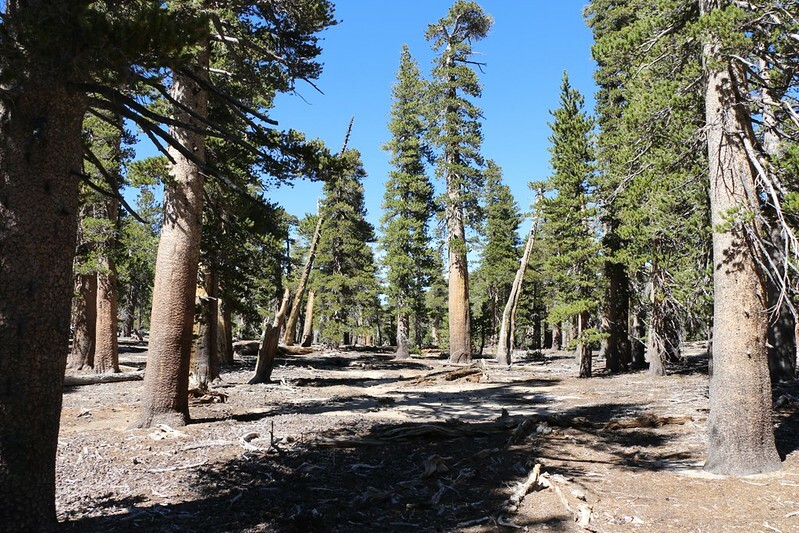 After that, we hiked along an easy cross-country route through a pleasant pine forest to Newton-Drury Peak (elevation 10,160 feet), our sixth ten-thousand-foot peak of the day! From the summit, we had fine views of the other five peaks we’d bagged, as this peak was the center of a semi-circle. A perfect spot for panorama videos. We were also just above our campsite, so we took the insanely steep route down the mountain, and arrived in camp within minutes. Whew! That was a fast descent! Sadly, I was about 25 years slower, as I didn’t dare to risk damaging my knees or ankles. Climbing Newton-Drury Peak, our sixth peak of the day! Once back in camp, we did some serious relaxing. 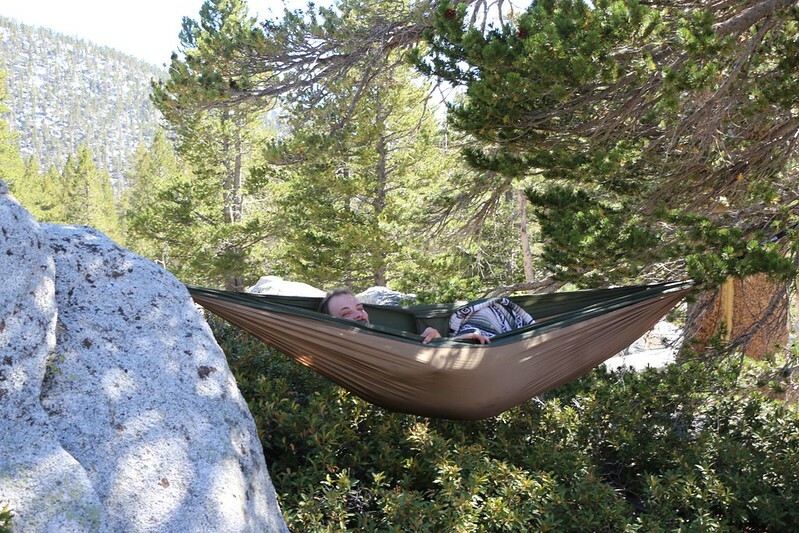 A hammock was deployed. Books were read. My son surprised everyone by pulling out a 64 fluid ounce growler of beer! It was huge! “What? You actually carried a half gallon bottle of beer all the way up here? Why?” I asked. “Because I could.” he replied, with a big old grin. It went completely against all the rules of ultralight backpacking, but there that ridiculously huge bottle sat, miles from the car, just asking to be consumed. And consume it we did. Oh, yes. Now THAT’S the way to end a long day of hiking! Two of the guys went down to the spring to filter some more water, while the other three lounged around. Then it was time to eat a good dinner, watch another sunset, and sink into the sleep we deserved. In the morning we got up fairly early, but not too early. We ate breakfast and started packing up our gear. 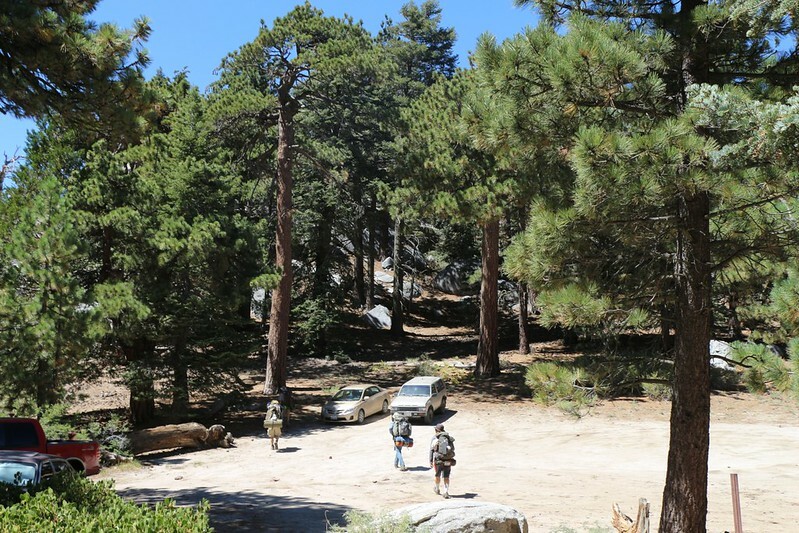 We double-checked that the campsite was clean, and we started the hike back out. 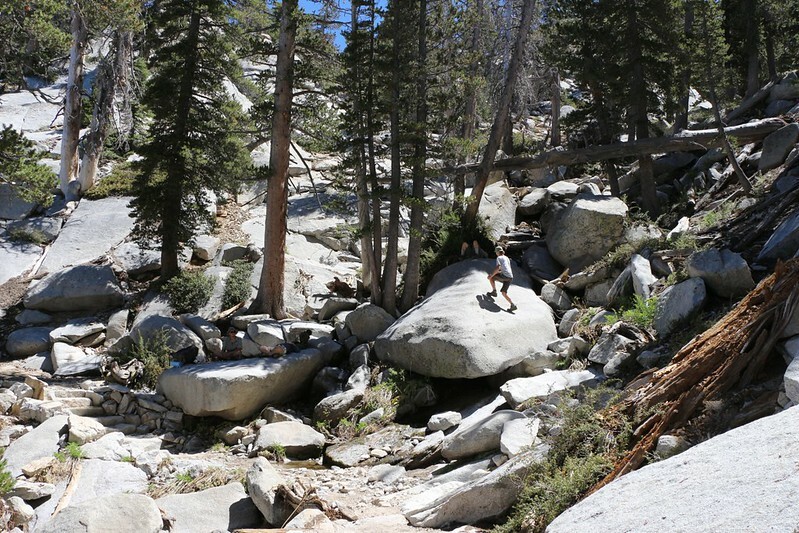 On the way, we took a cross-country shortcut down the streambed below “Bed Springs” and arrived back on the PCT. That saved us a mile, at least, and it was a fun hike. 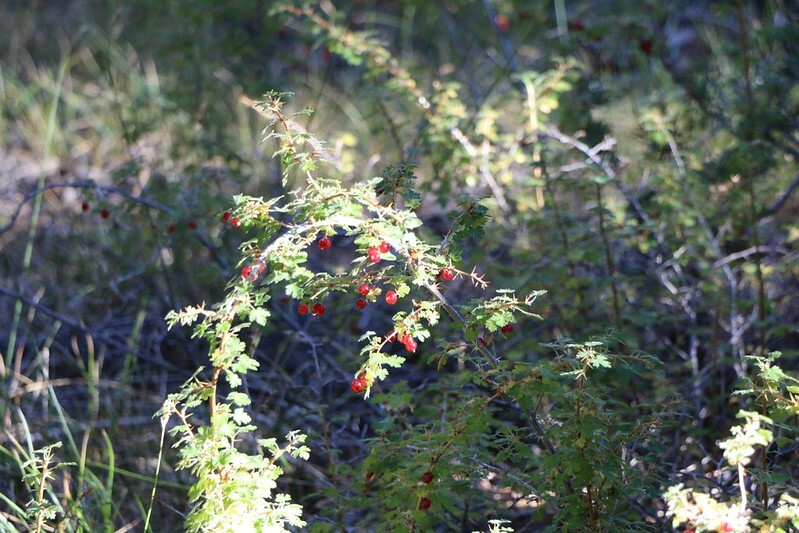 We even found some ripe gooseberries (currants) and ate them. Yum! 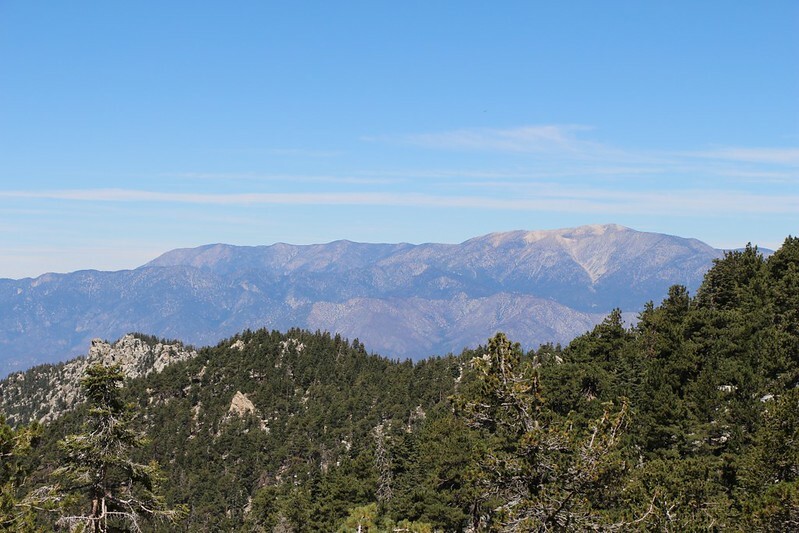 On the way out, we got to look back at Folly Peak, far up the ridge behind us, and also enjoyed the views down toward Idyllwild and north toward San Gorgonio Mountain. 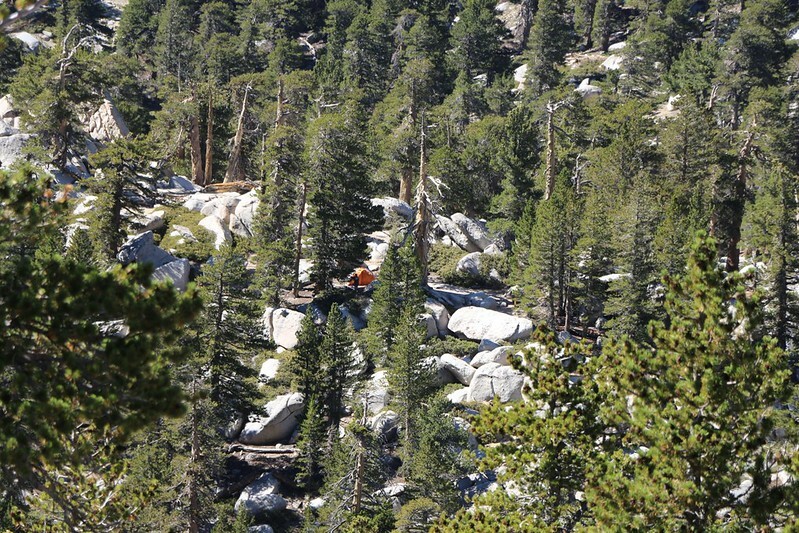 Naturally, yet more granite boulders were climbed. We didn’t take anywhere near as many rests this time, so we got back to the trailhead parking lot in pretty good time. All in all, a great time was had by all. All the hiking that I did in August prior to this trip left me in excellent shape; it enabled me to keep up with the youngsters, and I’m feeling rather smug. In fact, I’d never bagged so many peaks in one day.